WILLIAM JONATHON JOSHUA BENBOW was born 27 Apr 1888 in Geraldine to parents William Charles Benbow and mother Edith Stringer. He died 05 Aug 1936 in Timaru. He was bur: 7th Aug at Temuka Cemetery. Both his birth and marriage certificate have William’s middle name registered as John. Known affectionately as Willie, he first attended the Geraldine school and then was admitted to Temuka Primary School 26 Nov 1894. After passing Std. 6 he left in Oct 1901 and worked with his father for many years. As a boy, William remembered some people coming out from England to link up the family with the historical character Admiral Benbow. There was money in Chancery if the family could be retraced but evidently the papers had been lost. Our ancestors came from the same place. 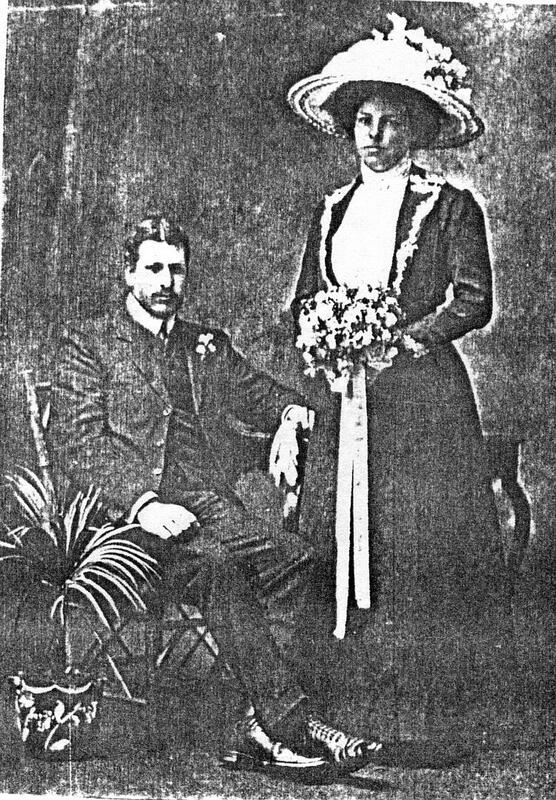 1911 Dec 11: Marriage: William married ALICE MARIA LOOKER ( b 26 Apr 1889 at Rangitata to parents CHARLES LOOKER (1853-1918) and SARAH HAWKINS (1858-1939); Alice d: 20 Mar 1970 Christchurch.) William and Alice Benbow lived Pleasant Valley in the house where his uncle William and Ann Guilford had lived before moving to Tarata, Taranaki. and did mainly cropping of wheat, oats etc. William had a keen natural interest in religion and birthday gifts given were usually big books eg “Daniel and the Revelations", “Patriarchs and Prophets" and he followed the teachings of the Bible students who are known today as Jehovah's Witnesses. 1912 On May 5, it was reported that: "Mr W. Benbow, of Temuka met with a painful accident. A dray in an open paddock was being loaded, when the horse became restive and bolted, and in attempting to check its career, Mr Benbow tripped and the vehicle passed over his back. Fortunately the dray was empty and no bones were broken, but he was somewhat severely injured." 1924 - Temuka Leader: A painful accident befel Mr William Benbow of Cross Street, Temuka on Wednesday morning, at about 8 o'clock. Mt Benbow was proceeding to his work at a fast rate along factory Road when he collided with an obstruction on the road, the force of the impact throwing him forward from the machine, He fell heavily on the ground, receiving severe facial injuries, and was renedered unconscious, while his tongue was bitten through. Dr Hogg was summoned and the injured man was removed to his home, where he is progressing as well as can be expected. William Edward Davie was b; 8 Aug 1889 in Te Moana, Geraldine, the son of George Davie and Sarah Jane Howden. He mar: his first wife Helen McKay on 4 Mar 1912 in Registry Office, Geraldine - (b: 23 Mar 1890 in Pleasant Valley, Geraldine to parents Hugh McKay and Mary Pinderjast; she d: 11 Sep 1939. 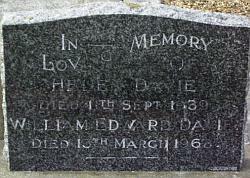 William Davie (d: 13 Mar 1968 in Ashburton Hospital bur: 15 Mar 1968 at Geraldine Cem. Presbyterian Sect. with wife Helen. Alice Maria Davie d: 20 Mar 1970 in Christchurch aged 80 yrs. 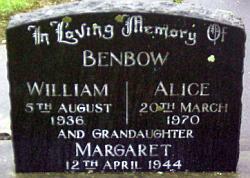 She was bur: 23 Mar 1970 Temuka Cemetery with Wiliiam Benbow. Photocopying was the technology of the 70's and lacked today's clarity. Your help is needed to update this documentation. Please, if you hold information or original photos of family members, could these be scanned and sent to add to or replace the unclear images of photos scanned from the 1974 Benbow book by Catherine Lincoln.